This product is RESTRICTED in the following states and countries: Canada, Wisconsin, Massachusetts, New Hampshire, Louisiana, New York, Minnesota, Illinois, Vermont, California, Maine, Rhode Island, and Connecticut. Check your state to see if it has been added to the restricted list. The Double Float® pump switch is designed to directly control pumps up to 1 HP at 120 VAC and 2 HP at 230 VAC in non-potable water, water and sewage applications. The Double® Float pump switch consists of two floats and a splice tube. Each float contains a heavy-duty mercury switch. 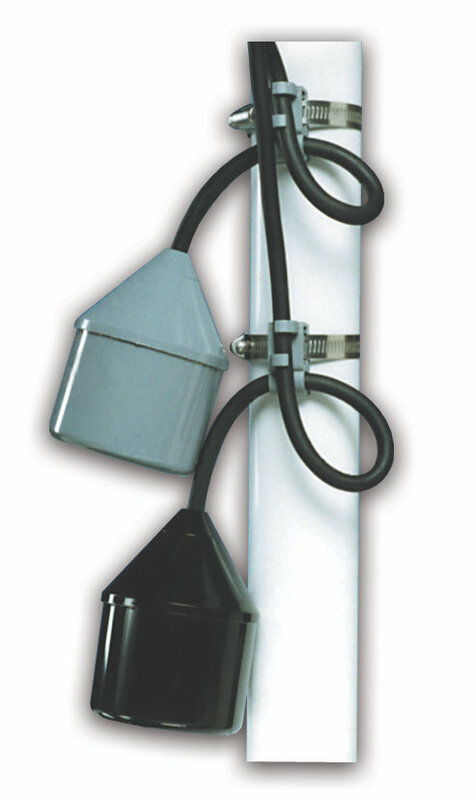 The splice tube contains a holding relay which enables the floats to function in series. The holding relay eliminates pump chatter in turbulent conditions, allowing the Double Float® pump switch to operate relay control panels for larger pump applications.